These products allow the Global access and control of multiple IP KVM or Serial console controllers as well as IP Management Servers cards. Suitable for Datacentres or multiple site access controlling the exact equipment selection availability for any remote users. Bringing required information to a central access point of your monitored power consumption or environmental data. Also available to a different purpose Data Centre equipment planning and design to aid expansions and identify any vulnerabilities before action plans cause problems. Easy multiple server control to bios level offering high security but virtual media access when required, with high performance systems that can be accessed remotely via IP. A power distribution unit (PDU) or is a device fitted with multiple outputs designed to distribute electric power, especially to racks of computers and networking equipment located within a data center. Individual server racks or bayed solutions with all required extras, Server Cabinets. Including vented front and rear doors, adjustable feet and travelling casters. For better enviromental control and access of bayed rack areas, the aisle containment system is an effective way of improving airflow management within Data Centres and IT rooms. IEC Locking Cables with more options of length and colour for your customers. 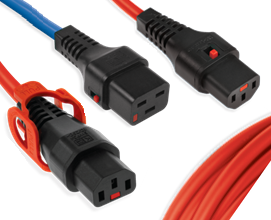 IEC Lock is a unique Locking IEC Connector socket system, Locking Power cables are now recommended to replace almost any standard power cable connection. Local and remote control capability with RS232 or USB port compatible with SNMP. Self diagnosis and protection function. With Peak value of current and short circuit protection design. Data Centre Infrastructure Management Systems Tools, Power IQ reduces the time it takes to administer PX firmware updates, because it helps track and distribute those updates.